Was it epoch making history? Or was it history making history? Hatharadenama Soorayo, the popular film of 1971 which starred a legend of the Sinhala cinema Gamini Fonseka, produced and directed by the affable Neil Rupasinghe created history in a film remake only second to the Hollywood film industry named “God Created Woman” by Roger Wadim. Hatharadenama Soorayo is the second in the history of film industry in the world that the same Producer and Director did a re-make of the same film after 37 years with the same theme creating a world record. The original cast Hatharadenama Soorayo had outstanding actors of the calibre of Gamini Fonseka, the romantic Vijaya Kumaratunga, Anthony C Perera and Senadeera Rupasinghe with the most intelligent actress of the Sinhala film industry Malini Fonseka in the female lead. Rupasinghe recently created history in the Sri Lankan film industry being the same producer and director of the film Hatharadenama Soorayo which had four youngsters like Buddhika Jayarathne in Gamini’s role, Roshan Pilapitiya for Vijaya Kumarathunga’s role, Jagath Chamila did an Anthony C Perera and Amila Abesekara took over Senadeera’s place in the cast. Chathurika Peiris was chosen to play the role of Malini Fonseka and Kanchana Mendis in the supporting role earlier played by Sriyani Amarasena. Also in the female cast were Manjula Thilini and Nadeesha Alahaperuma. 37 years later Rupasinghe who created history by the remake of the film was a proud man, who had this to say: “The film was reproduced and directed by me not with the wish of creating any records. But to keep the theme of the film alive with youngsters in the cast”. He, however lamented that it was difficult to replace legendary men and actors like Gamini Fonseka, Vijaya Kumaratunga, Anthony C Perera and Senadeera Rupasinghe who played the prominent roles in the film. Buddhika Jayarathne who played the role of Gamini Fonseka did his best but one can’t expect the same from him as we saw in the legendary man Gamini Fonseka as an actor. Another feature in the remake of this film was the new technical effects introduced with the advanced technology with slight changes to sound, editing, creative fighting and lighting. 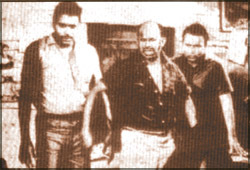 Hathara Denama Soorayo 2008 version - Jagath, Buddhika, Roshan and Amila. The remake of the film, according to Neil Rupasinghe had cost a staggering 15 million with a shooting duration of 90 days. Technical operation of the film clearly defines the difference between the mini screen and the larger screen. Up and coming producers Lalantha Watudura and Malcom Stanislaus, a Dentist by profession assisted Neil Rupasinghe in the product of film, Hatharadenama Soorayo. The new version of the film however, sadly lacks the personality and looks of a Vijaya Kumaratunga and character and charm of a Gamini Fonseka. The roles of the female partners come close to the original actors but a void could still not be ignored. Perhaps it is also due to the elements such as the surroundings, locations and dialogues of those of the original cast. 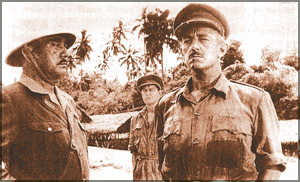 Sassue Hawakawa as the Japanese PoW Commandant and Oscar winning Sir Alec Guinness as Colonel Nicholson. The 80th Hollywood Oscar Awards was scheduled for the February 24 despite the ongoing strike by the Screen Writers’ Guild. Looking back half a century. The 1958 ceremony was of great significance to Sri Lanka. The movie “The Bridge on the River Kwai” won seven Oscars: best picture, director, actor, and the awards for cinematography, editing, score and screenplay. Directed by the master movie maker Sir David Lean it starred the brilliant Sir Alec Guinness, William Holden, Jack Hawkins and Sessue Hayakawa. The picture was shot in Sri Lanka in 1956 mainly in Kitulgala and Ambepussa. Many Burgher boys were taken in as extras to play the British PoWs. One in particular attained a sort of immortality by whistling the “Colonel Boogie March” when asked by a production executive to hum collectively to lighten up the laborious march. This was retained in the completed picture as a part of the award winning score. The writer was in his late teens then and was at some location sites watching some of his colleagues in action and marvelled at the magic of movie making. The most interesting was the Studio publicity boys and their advance handouts with flamboyant prose screaming away exotic yarns. One example: “ peasants fled in terror today [08.11.1956] as para-troopers descended on a village. They set the temple bells ringing to signal the start of an invasion. Police were called to explain. Another: “When shooting commenced at Ambepussa (village of the mangoes) the local headmaster declared a half-holiday and the ring-side seats were taken by mothers nursing babies at their breasts, old timers, many of them centenarians, farmers and herdsmen, and even the village constable...” But the imaginative publicity hacks failed to christen Kitulgala, “Stone of Nectar,” or by some such name! It is amazing to note and witness the contemporary Chinese Cinema as it comes out of the box, as it were, to explore varied themes far from the regimented orientation of the past decades. It is a welcome move and sign indeed. I happen to watch many such films from that country both in Panaji (Goa in India) and Thiruvananthapuram (also in India) late last year. Among them was a film called Teeth of Love directed by Zhuang Yuxin, who teaches at the Beijing Film Academy. Here is a brief note on the film: The film is really a study of character of a particular young woman (played admirably by Yan Bingyan). This character’s development against the backdrop of economic and social change in China after the Mao regime is unbelievable and shockingly realistic. Her story begins with her tomboy bullying teenager in the 1970s and taking a tough stance as a card carrying political member. She then becomes a doctor in a rural hospital and has an affair with a patient who was married. She is amorous in her sexual passion - a change from her bullying nature at the beginning. 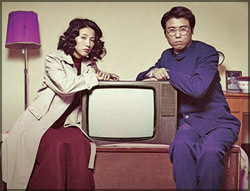 She returns to Beijing and gets married to a shy man. They have a child, but she is sad and not happy. She becomes matured. The film is neither sentimental nor melodramatic. There is restraint atmosphere. It’s a kind of Brechtian atmosphere. At the beginning of the film I felt bad of her daring behaviour, but as the story developed I showed signs of empathy towards her. Indeed she becomes an interesting character. The film is realistic in that it shows the unwelcome traits in her character turning into self realization. Her character development comes to fruition when she turns a complete woman at the end, after suffering mostly because of her wrong doings. The abortion scene where she herself performs on her with a little help from her former married friend is shockingly nauseating. She had had relationships with three men during a period of 10 years and each episode is excruciatingly painful to her and to the audience as well. For most orthodox viewers the film may be weird. However, I enjoyed the film for its cinematic potentialities. This is the director’s first film although he had achieved laurels as a television film maker. Jodhaa Akbar, the epic romance between Mughal Emperor Akbar and the fiery Rajput princess Jodhaa is screening at Liberty Cinema. Directed by Academy Award nominated director, Ashutosh Gowariker, the movie stars Aishwarya Rai Bachchan and Hrithik Roshan and was released across 26 countries in USA, Europe, Asia and Middle East. 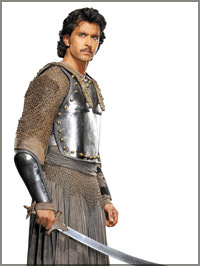 The film is dubbed in 3 languages - Hindi, Telegu, Tamil; and subtitled in English, Arabic and Dutch. It is viewed across 1500 screens worldwide making it the biggest release ever for an Indian film. In India alone the film was released in more than 1200 screens of which 500 are through digital cinemas and 825 through physical prints. Set in the 16th century, the epic movie begins with a marriage of alliance between two cultures and religions, for political gain, with King Bharmal of Amer giving his daughter’s hand to Emperor Akbar. When Akbar accepts the marriage proposal, little does he know that in his efforts to strengthen his relations with the Rajputs, he would in turn be embarking on a new journey- the journey of true love. From the battlefield where the young Jalaluddin was crowned, through the conquests that won him the title of Akbar the Great, to winning the love of the beautiful Jodhaa. Jodhaa Akbar traces the impressive graph of the mighty emperor and his romance with defiant princess.